Over the last couple of years, Sharon and I have tried to see most of the Oscars nominated films. After dinner at Taro's, Sharon and I went to see The Revenant. With the Oscar nominations not out until January 14, I googled a number of sites this year trying to find out which films the critics thought would be nominated. The Revenant is nominated for a Golden Globe and seems to be on a lot of lists of the best films from last year. Set in 1823 Montana and South Dakota, the film was inspired by the experiences of frontiersman and fur trapper Hugh Glass. It is based in part on Michael Punke's book The Revenant: A Novel of Revenge. The film stars Leonardo DiCaprio and Tom Hardy. DiCaprio plays Hugh Glass. The scenery and cinematology are amazing. There is no computer-generated imagery and the film was shot with natural lighting. This is definitely a movie to see on the big screen. Sharon liked DiCaprio's performance a lot more than I did; she thinks that he can win the best actor. 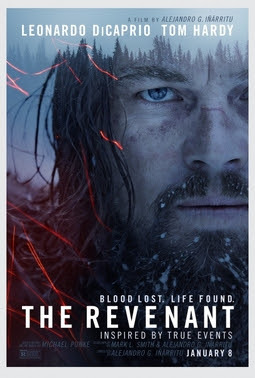 If it is nominated, I don't think that The Revenant wins best picture.